Aku rindu giler dekat arwah mak dengan abah. How i wish i could turn back time, where my parents are here with me. Abah..mak it's Ramadhan now, it is 3rd time Ramadhan without you and i feel missing..lacking of something.... And when Syawal comes, i don't know what to say, lagi laa...now i can feel the emptiness is slowly approaching me. Since you'd gone, i'm not really in the mood celebrating raya like i used to be. It gives me pause when everytime the tv shows Raya's ad. Suddenly it drags me deep into raya memories with abah and mak. Abah dengan mak orang yang paling semangat sekali sambut raya. Early raya morning, surely kepoh. Abah memang kepochi...And i laughed alone... but then i cried alone when actually all of it was just a past! Passing the days without you, something hard actually... but i just ignore the sorrow, i just don't wanna think about it so much. Seeing the sad soul inside me, only He knows how bad it is. And again i have to move on, at least i still have the loved ones around me.. There are times where i really can't throw away the sadness in my life. It's normal i guess..for a regular person like me. The biggest sadness for me when i lost both of them. It has been past two and half years, and yet it's still. They are always on mind from the time i wake up and till i close my eyes at night and sometimes i see them in my dreams. You don't know how you miss something until it's gone... it's true. Ya ALLAH...gimme strength to face Your test. I know, everthing that happens in our life, happens for a reason. And everything that happened in my life, it was a test to measure my patience and faith and it changed my life in many important ways. ALLAH yang menentukan segalanya, kita sebagai hamba-Nya yang hina dan mengaku beriman kepada-Nya, seharusnya redha dengan ujian-Nya. betul ya tay - what ever it is, we all still miss our parents ya.. I felt the same, perasaan tidak berubah, Raya datang dan pergi, ramadhan datang dan pergi, syawwal datang dan pergi.. kita terus berdoa untuk mereka.. I pun macam you, kalau dapat jumpa best friend our parents, terubat juga rindu tu ya! What about your uncle? 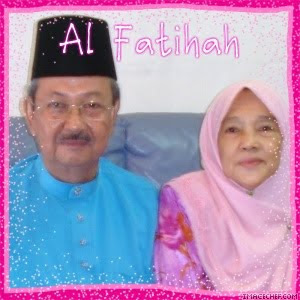 I ada pakngah - muka mcm arwah my father. Kalau jumpa mesti rasa sayu je..